Today's gig workers are a fundamental part of the American economy, offering opportunities as diverse as society itself. Find out how you can survive and thrive in this golden age for independent workers. InfographicWho is Today’s Gig Worker? New to the gig economy? 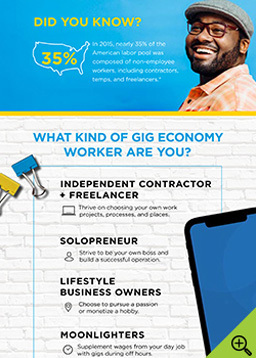 Take a quick, visual look at some independent worker definitions to see where you fit in. Take a look at these videos to help guide you along the self‑employment path. The gig economy is constantly evolving — and so are the resources to help you navigate it. 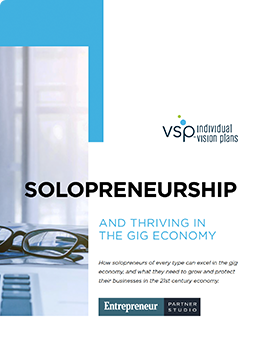 Get the latest resource to help you on your journey to solopreneurship and find out how you can make the gig economy work for you. Being a solopreneur doesn’t have to mean going at it alone – well, at least when it comes to your benefits. Get a VSP® Individual Vision Plan for your workplace of one. Enrolling is easy and no need to wait for open enrollment. Have more questions? Check out the FAQs below. Even if you don’t have access to vision coverage through work, you can still get vision benefits through VSP Vision Care. $200 is the average annual savings* for VSP Vision Care members. This amount varies by zip code, so you may save even more! It depends! Based on your zip code and vision needs, the right plan for you may vary. Our plan finder will help you decide. *Savings are based on national averages on comprehensive eye exams and most commonly purchased frame brands and may vary by VSP plan and purchase selection, average savings determined after benefits are applied. More information headed your way. Enter your email to find the most popular VSP Individual Vision Plan in your area. Just tell us where to send your plan details, or try the Plan Wizard below. Visit your inbox to see example plan details. Learn more about comprehensive vision coverage you can buy on your own. Contact a plan advisor today! Select the whitepapers that interest you and we’ll send them your way! Please check at least one checkbox. Visit your inbox to see your whitepaper downloads.